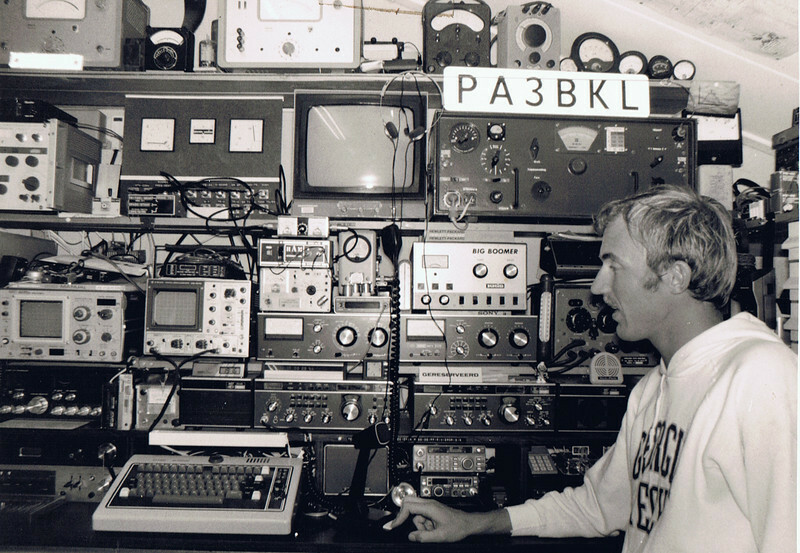 Robbert / PA3BKL in 1985.... (I was 29 here, sun-tanned, just came back from Florida USA). Drake Line (TR7 + MN7, and R7 + MN77) [sold the complete Drake-line to EA3NJ in 2009]. Kenwood TR-7800 (Mobile set: 2 meters FM). ICOM IC-120 (23 cm FM). Kenwood TS-770E (Base: 2 m/70 cm, FM/SSB/CW). The 'keyboard' there is the notorious TONO-9000E: a great RTTY unit (for that time!! but the RTTY signals sounded 'clicky', I added some filters as a mod). See also the great AMT-2 (Amtor), on top of the TRIO Oscilloscope. To the left of the scope: a Takeda Riken Spectrum-Analyser, in that time very popular among the CAI builders in the Netherlands. Suddenly many local FM pirates came to our house with their (ILLEGAL) transmitters and asked if I PLEASE could check if their (illegal) FM modulated spectrum was 'clean', ha ha!! Just to the left of my nose you see a 'Big Boomer'. It was a Linear Amplifier (tubes!! ), a '200 Watt booster' for the 27 Mhz 'Citizen Band'. The (Dutch) licenced radioamateur community was quite upset that I (as an official licenced amateur) 'dared' to appear on the cover of Radio Amateur Magazine [RAM] next to 'that thing for citizenband pirates...'. Hey guys: MANY of us STARTED the hobby with 27Mhz!!! It is NO SHAME! !